Sometimes, you just need to get a list of filenames into Management Studio. I typically need this when choosing files to restore for non-production backups, but there’s plenty of possible uses. The easiest way I’ve found of getting a list of files into SSMS (or any other editor) is via the clipboard, specifically using clip.exe, found in C:\Windows\System32 on Windows 7 and Windows Server 2008. 24/08/2012  04:39 AM    <DIR>          . 24/08/2012  04:39 AM    <DIR>          .. But I’m on Windows Server 2003! If you don’t have clip.exe available, you can get similar functionality by adding one extra step – redirecting the output to a text file, from where you can easily cut and paste. Note that using the “start” command will allow you to use whichever program is set as the default for .txt files. Remember to go back and delete tmp.txt. It’s a simple trick, but one that can be incredibly useful, and well worth a place in your toolbox. 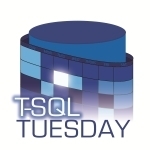 It’s T-SQL Tuesday again, and this month’s gracious host is Mike Fal (Blog | Twitter), urging us to deliver wonderful stories about SQL Server trick shots. The first thing that comes to mind is the Yo Gabba Gabba “Cool Tricks” segment. You should probably read the rest of my post before watching the video, or you’re liable to end up watching Flight of the Conchords shorts for the next twenty minutes. My trick shot is nothing particularly revolutionary, but my hope is that at least one person hasn’t seen this trick before. I’ve used it often enough that I’ve got it down to a fine art. 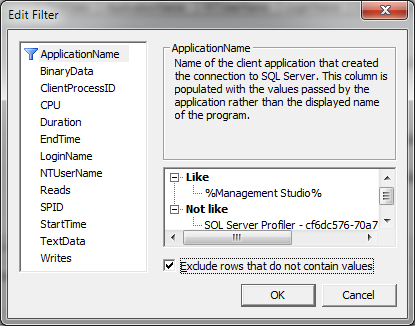 The trick is using SQL Server Profiler to discover the inner workings of SQL Server Management Studio. Almost everyone knows about the “Script” button at the top of most dialog boxes to generate the T-SQL commands to perform a specific action, but occasionally you want to see exactly how SSMS came up with something it is displaying on screen. There’s nothing particularly special about SSMS – it doesn’t appear to interface with SQL Server in any way other than you or I could, using primarily T-SQL commands, with a bit of SMO thrown in. This generally means that anything you can see or do with SSMS, there will be an equivalent, and you can capture this activity. For example, one of my preferred methods to see how much space is available in a file is to use the Shrink File dialog (right click the database in Object Explorer, Tasks, Shrink, Files). There’s 220 MB allocated, and 36.75 MB available. That could be a very useful thing to know, and to use in my own set of diagnostic queries. How does SSMS determine this? Time to bring out the trick shot. 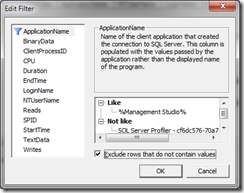 Fire up SQL Server Profiler from the Tools menu, and connect to a non-production machine. You can keep all the default events, but the important part is the filter. If you’re on a machine by yourself, a simple filter on Application Name (like ‘%Management Studio%’) is sufficient, but you can add extra filters for your login name if necessary. This returns a UsedSpace of 187648 KB (183.25 MB), and AvailableSpace of 37632 KB (36.75 MB), the sum of which is the 220 MB shown above. We’ve managed to discover that SSMS uses sys.dm_db_file_space_usage to determine free space. What have I learned here? When I ran the test again to write it up, I was a little surprised to see sys.dm_db_file_space_usage appear. This has been available since SQL Server 2005, but this part of SSMS just hadn’t been updated to take advantage of the DMVs until now. There you have it – if you see any interesting value come out of SSMS, use Profiler to see exactly how they did it, and you can learn from it. My name’s Jim, and my cool trick is using my Profiler x-ray glasses (go watch the video now).